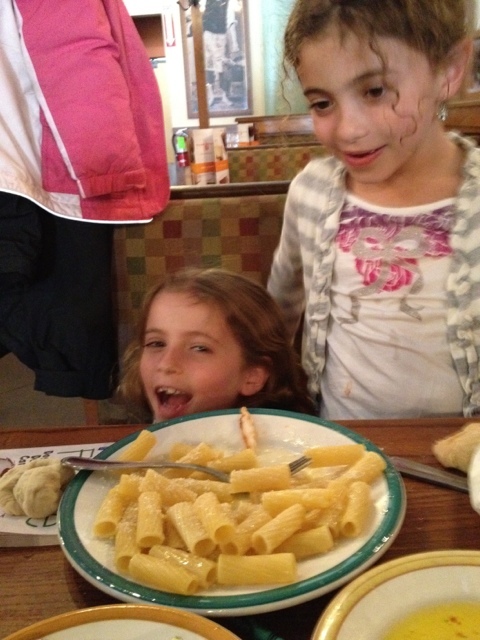 My twin granddaughters, Esme & Baya, now 7, love going to Bertuccis as here is where they are each given a small lump of pizza dough to play with. Esme in particular was very creative this past Sunday & made herself a dough headband which quickly lost its shape & nearly ended up covering her eyes. Then I suppose it could have become a disguise for a bandit, or were she much, much older, a gooey eye treatment for crows feet. Baya & I were giggling uncontrollably at her creations though, and that was her objective. Next Essie (brief sidebar here: my daughter Rebecca once complained to me that I was always giving the girls nicknames & the problem was that they stuck) called my attention to the fact that she’d made a seashell, and held up her finger to show me. It did look very much like a shell, albeit very large & rather gooey. The twins & I love gooey. Baya meanwhile had been growing restless with all the attention I was paying to Esme, and suddenly slipped from her seat in the booth next to me and disappeared underneath with a large crack in the head. I next saw Esme suddenly start trying to wriggle away from Baya, who’d ended up across the table in Esmes’ lap & was doing everything possible to annoy her-tickling, and reaching up to denude Esmes’ finger of its’ shell. There was a lot of bumping and laughter going on while I pointed out we were in a restaurant and some people were trying to eat. That seemed to encourage them to get louder & sillier. Next Baya came back next to me-again under the table & again cracking her large head. She was laughing which I took to mean she’d suffered no pain, and before settling on her side of the bench she stopped to plant a big ‘gooey’ kiss on my lips & telling me she loved me. You would think they were ready to settle down & continue to peck at their dinners a bit. And I use that word ‘peck’ on purpose; they eat like sparrows on a diet. But no, they had eaten a few bites, and were still feeling like playing. The first I knew of this, they were licking those plastic packaged pats of butter, and throwing the empties at each other, laughing uproariously at their new game. Then they discovered the whole packages flew much faster (and wilder) than the licked out empties. By now I was getting worried that their daddy would show up any second and start giving out ‘punishments’. I tried again to reason with them, but that seemed only to encourage them to wilder tosses, out in the aisle, unto the next table-thankfully empty, and still aiming for each other. There was no way they’d listen to me & stop this ill mannered game. Finally as their ammunition was scattered all over the place and I raised my voice loud enough to sound like an irate adult they stopped. But only long enough to gather up their ammo and reseat themselves, and began once again to eat butter pats. By the time daddy had returned to the table, I had swept up all that plastic, dumped it on to a dish and covered it all with a crumpled napkin, convinced the twins that I would tell on them, was peace restored as though nothing out of order had happened in his absence. What have these two learned by the age of seven? To be deceitful. They have an ever ready excuse to always blame misdeeds on the other. That daddy was the parent to be reckoned with. That nana was always on their side (more to follow on that in future blogs), and that they are truly gorgeous. My political views here also demand a voice here. During the butter war, I remembered earlier days when smaller pats of butter were served on squares of paper underneath with a waxed paper square on top. Now didn’t those butter pats contribute far less pollution to our dumps? I am sure so, for now the zillions of tiny butter boxes have to end up as unrecyclable trash. This thought has disturbed me since Sunday, today being Tuesday, and I don’t know how to stop my wheels from spinning. Or have a voice elsewhere to draw attention to this issue. Signing off for now. Hope you found some humor here as well as food for thought-pun intended, of course. This is my first entry here and I hope you will leave comments. I am going to try to stack the deck by notifying my family and friends that I am blogging again after many years off. You have the patients of a saint and the amazing ability/awareness always to be with B & E totally in the moment. Esme and Baya are truly blessed to have you in their lives. (as are all of us who know you). OOpps..that should have been “patience”. I am sitting in my office as I write this so you know where my head is at…. Hi, Ms. Faye. Welcome back to blogging. Lovely person and friend you are and I have missed your writing. Thank you for the inspiration. I’ve wondered what happens to all the safety razors and trash bag twist ties myself.